Tropical Storm Kujira tracked over Hainan Island, China and moved into the Gulf of Tonkin when NASA's Terra satellite passed overhead. 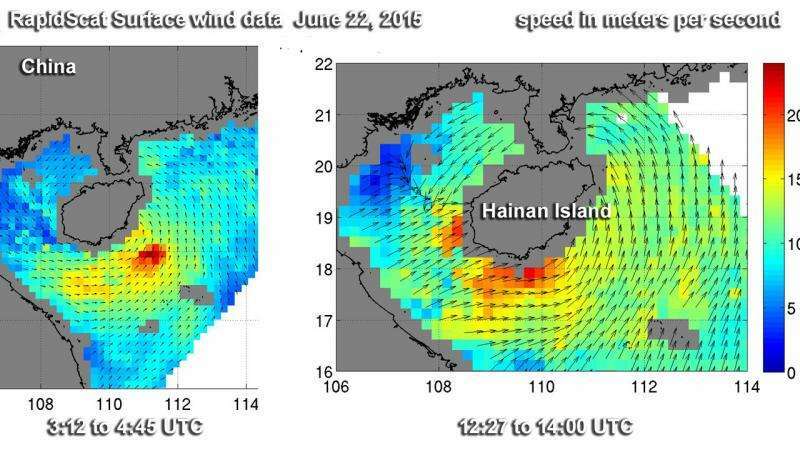 The RapidScat aboard the International Space Station captured 2 views of Tropical Storm Kujira's surface winds on June 22, showing the strongest winds shifted from southeast to southwest of its center as it moved over Hainan Island. The Gulf of Tonkin is a body of water in the South China Sea. The gulf is bordered by Hainan Island, China to the east, mainland China to the north, and Vietnam to the west. On Monday, June 22, RapidScat had two views of Kujira. The first view of Kujira came a few hours before landfall on Hainan Island. RapidScat data showed the Kujira made landfall surface wind speeds near 65 knots. RapidScat also saw the strongest winds were southeast of the center of circulation. Nine hours later, RapidScat showed Hainan Island engulfed by Kujira after landfall. Kujira had much lower wind speeds, and the strongest winds shifted southwest of the center. On Tuesday, June 23, 2015, NASA's Terra satellite passed over Kujira as it moved into the Gulf. The Moderate Resolution Imaging Spectroradiometer or MODIS instrument captured this image of Tropical Storm Kujira in the Gulf of Tonkin. The eastern quadrant of the storm was still blanketing the western half of Hainan Island, while the western quadrant was over central Vietnam. 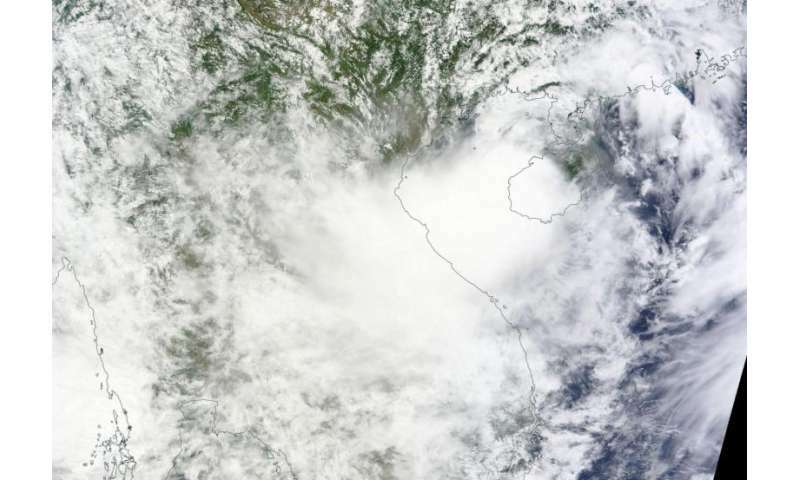 At 1500 UTC (11 a.m. EDT) on June 23, Tropical Storm Kujira was centered near 20.1 North latitude and 107.8 East longitude, about 120 nautical miles east-southeast of Hanoi, Vietnam. Kujira was moving to the west at 8 knots (9.2 mph/14.8 kph). Maximum sustained winds were near 35 knots (40 mph/62 kph). The Joint Typhoon Warning Center forecast calls for Kujira to turn to the northwest and move through Gulf of Tonkin before making final landfall into northeastern Vietnam by June 24 around 0000 UTC (June 23 at 8 p.m. EDT). For local watches and warnings, visit the Vietnam Hydro-Meteorological Service website: http://www.nchmf.gov.vn/ .